A giant funnel is being built in the Gulf of Mexico to channel the oil spill from the seabed to surface. But since there is no guarantee it will work, Russian experts think Soviet history may offer a radical solution. A pillar of fire 120 meters tall. That alone is tough to extinguish, but when the fire is fueled by natural gas, it becomes virtually impossible. In 1963, one of the Soviet Union's gas-rich locations was badly drilled. The resulting fire burned for three years, with the intensity never waning. All possible ways of fighting the flames were tried – to no avail. “It was 12 million cubic meters of gas, burning daily. Now multiply that by 3 years. And the price of gas! Nothing worked, the flames were unstoppable. So our boss, the Minister of Nuclear Energy, came to us, and said ‘Boys, let’s help out.’ And we did,” nuclear physicist Albert Vasiliev remembers. The offered solution? A nuclear explosion. Now, that to a layman might sound like swapping a big problem for an even bigger one. But that is not necessarily the case. “Think of this as a doctor's case. You have a small problem – you take some pills, maybe stay in hospital for a while. But if the problem is incredibly serious, you will probably have to undergo surgery. This is what we were – surgeons. It was a last resort, but it worked,” Albert Vasiliev says. It was nowhere as easy as it sounds, however. Although peaceful nuclear explosions had been tested in both the Soviet Union and the United States by this point, to use a nuclear device for such a measure was a first. “The idea was to drill a small, angled shaft and set off the bomb, so that the explosion would block the leak. But people weren't sure where to drill, because no one knew exactly where the pipe leak was. And it was so loud. You can't imagine what a fire like this sounds like. Worse than a hundred jet planes all at once. Difficult to access, difficult to work close to – it was a tough job,” former science editor of Komsomolskaya Pravda daily, Vladimir Gurbaev told RT. Despite these problems, all went well. The leak was closed. The method was pronounced effective and later used on several other similar problems. "The explosion should be carried out above the leaking hole. After the blast the hole seals up. It's similar to stopping the oxygen supply in a human being," explained Vyacheslav Klishin, physicist and nuclear gas-well fire fighter. Now, some have already suggested that this approach could help stop the catastrophic oil leak in the Gulf of Mexico. "If the explosive element fits the well, then it's possible to use it in this case. 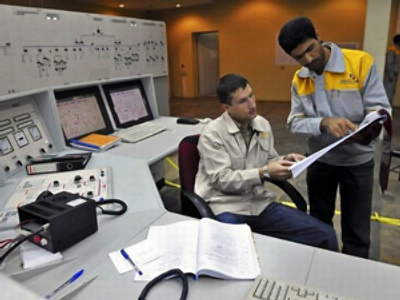 Anyway, workers in the Gulf need to tie up the well where oil leaks out and there are two possible ways to do it: a nuclear explosion or another well," Vyacheslav Kishin said. But the situations are very different – the Soviet gas leak was in the middle of a desert, with not much flora and fauna to suffer from potential after-effects. The Gulf's wildlife is already critically damaged by the leak. A nuclear explosion, however small, may add to the ecological disaster rather than prevent it. Dealing with the devastation of the oil spill is one thing, but fingers of blame are also being pointed over the catastrophe in the Gulf of Mexico. RT spoke to investigative journalist Webster Tarpley over whether lawmakers have been putting profits before people.